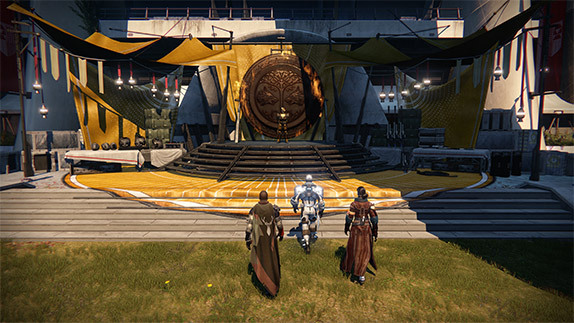 Lord Saladin is poised for a return to the Tower. This time, his reappearance will be intentional. After a surprise ambush during what was supposed to be his sabbatical, we sent him packing again. More work was left to be done to realize his new potential. Some of that work happened today during a planned maintenance window. If the next Destiny Updates stick their landing, we’ll light his shield again very soon. You’ll be invited to approach his altar of war and glory by the end of next week, if all goes well. Days ago, I stepped into a place we call Hive. Inside Bungie, what used to be an executive war room secreted away behind sturdy double-doors has become a playtest lab. All are now welcome, but all who enter are expected to fight. It’s a place where our cabal of designers locks horns to see what works in our game – and what doesn’t. We also like to see who among us is the best. It was the perfect setting to give the new Iron Banner a dance. Standing at left is Tyson Green. Weeks ago, he made some promises for how we intended to buff Iron Banner. With a package that you’ll install on Monday, we’ll be making a bid to keep them. As always, you’ll be the Judge. To wield that gavel, you’re gonna need to gear up. >> Lower-level players wielding fully-upgraded weapons should still be considered a very credible threat! Claim victory to gain reputation. Acquire exclusive Iron Banner rewards. See Lord Saladin for details! Before we lure you back to the most competitive challenge to be found in the Crucible to date, we’ll be opening a hailing frequency between you and other Guardians. It’s no secret that that the team who communicates with each other tends to win with each other. When used strategically, your most important weapon can be your voice. On Monday, November 17th, we’ll be delivering the first of several Destiny updates scheduled for this month. This one will contain a Beta test for a new feature that will let you access a voice channel shared by the players you meet via Matchmaking. Click the Ghost to get the full story. In summary: Navigation mode will connect you with willing allies on your side of a matchmade conflict – be it against man or beast. If they want to talk to you, the path will now exist. The question becomes: Will they choose it? Think of this as a trial step into a more vocal world. 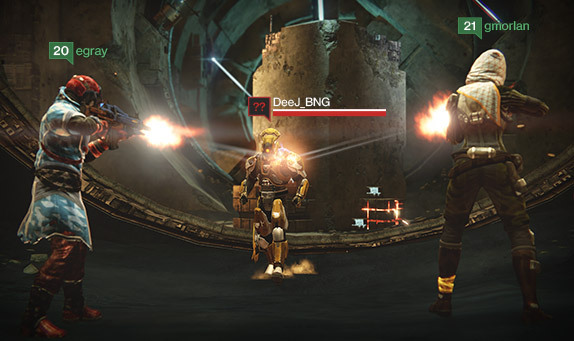 We know that matchmade teammates aren’t the only people in Destiny to whom you want to speak. Your Mom told you never to talk to strangers. We think she was probably right, but we’re willing to provide you with an option where you need it for tactical gain. Next week, we’ll also let slip something we’ve been keeping a secret. Did you acquire a Destiny collector’s edition that included an Expansion Pass? Did you acquire an Expansion Pass separately since then? If you have, we’ve got a special surprise for you. If you have not, but think you might still help yourself to The Dark Below, you’ll also be invited to enjoy. The details are still secured in a crate. Early next week, the information we’re guarding will fly through the air with the greatest of ease. When it lands, we want there to be no doubt that this is for you, and that you’ll have a chance to enjoy it first. We want to make sure that you traverse the next leg of your journey in outrageous style.